The women's suffrage movement lasted at least 70 years, from the first formal women's convention in 1848 in Seneca Falls, New York to the passage of the 19th amendment. During the early 1800's, the idea of equality became more prominent and social conditions for women began to change, which led to the birth of the Women's Suffrage Movement. Although women were still considered weaker then men, they started to receive more educational opportunities. For instance, by the end of the 19th century the number of women students increased to more than one third then before. Also, the foundation of colleges for women as well as events at women’s rights conventions challenged society’s views on women’s traditional roles. Higher education was broadened by the rise of women's colleges and the admission of women to regular colleges and universities. In the 1800's women were stuck in the Cult of Domesticity. Women were seen as less superior and weaker to men. They were labeled as the moral keepers for societies as well as the non-working house-wives for families. Also, women were considered unequal to all men legally and socially. However, women's efforts during the 1800's were effective in challenging a women's place in society. As for work, women were discriminated against. Many people believed that a women's place was in the home and that cooking, cleaning, and taking care of the family was their job. In the early 19th century, the jobs most readily available to women were domestic and factory work. For an example, during the first half of the nineteenth century teaching became a respectable job for middle-class women. Also, women started working in factories as seamstresses in places like the Lowell Mills. They were given a very low salary for this tedious work. However, they were happy to fill this position because it was an opportunity to get out of the house. Since women were able to earn money, even though it was a small sum, it gave them more independence. Women began to start taking part in reform movements in the 1800's, which gave them little involvement in politics. As a result, women began to wonder why they were not also allowed to vote. The first major public appeal for women's suffrage came in 1848 when Lucretia Mott and Elizabeth Cady Stanton called for a women's rights convention in Seneca Falls, New York. At the convention they created the Declaration of Sentiments. The Declaration of Sentiments demanded for women to have equal rights to men in education, property, voting, and other issues. Leaders of the suffrage movement constantly strived for women to have the right to vote so that they could use it to gain other rights. However, the suffragists faced many struggles on the road to equality. Most people who opposed woman suffrage believed that women were less intelligent, therefore they could not make good political decisions like men. The drive for woman suffrage gained strength after the 15th amendment to the Constitution was created, which gave the black men the right to vote but not any women. 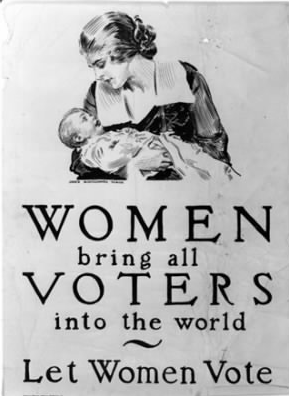 Women had three approaches to achieving the right to vote. The first one was to ask states to grant them the right to vote. This worked for a few states but mostly failed. The second approach was to present court cases by saying that they are citizens just as much as men are and that therefore they should be granted the fourth amendment as well. The third and final approach was to push for a national constitutional amendment that would grant women the right to vote . However, this continued to fail. Women continued to keep striving to achieve there goal until justice was made. Before the Women's Suffrage Movement women were looked down upon socially, economically, and politically. Socially women were viewed as less superior to white males therefore they were denied of many rights. People believed that their sole purpose in life was to cook, clean, and take care of the family. Also, there was little educational opportunities for women. 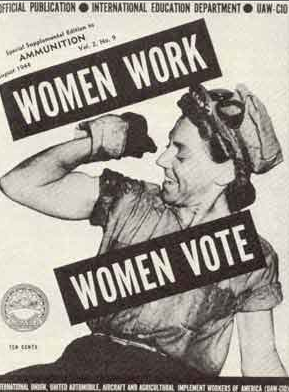 Economically, women were discriminated against and given very few options for jobs and their salary were very low. Politically, women were denied of many rights such as the right to vote. Once women started becoming apart of the reform movements they realized that they should be fighting for their rights to. 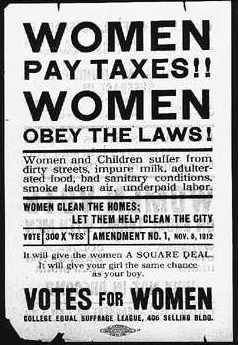 This drived the women to fight for equal rights amongst all Americans, female or male, black or white. As you can see, women's lives before the Women's Suffrage Movement were very similar to those before the Women's Rights Movement.